It seems that no one, including perhaps the government in Ankara, is entirely clear on what Turkey’s endgame in Syria is. Recent reports that the United States and Turkey had agreed to establish a “safe zone” along the Turkish border were quickly contradicted, while terms like “buffer zone” and “security zone” are now floating around. With Ankara nonetheless eager to establish some kind of zone in Syria, it might be a good moment to review Turkey’s history of threatening to invade its southern neighbor — and look at to what extent those threats have worked out in Turkey’s favor. On several occasions, most notably in 1937 and 1998, the Turkish government discovered just how effective it can be to flex some military muscle along its southern border without actually launching a full-fledged invasion. Indeed, the success of Turkey’s previous non-invasions might make a similar approach seem very appealing to policymakers in Ankara trying to decide what to do today. Yet revisiting this history also suggests that, absent a coherent political or diplomatic strategy for the region, saber rattling in Syria’s direction fails to bring Turkey lasting security or stability. Turkey’s disastrous relationship with Syria has its origins in the province of Hatay, a beautiful region that was best known for its Christian history and remarkable cuisine before the Syrian civil war. Following the Ottoman Empire’s defeat in World War I, the province, then known as the Sanjak of Alexandretta, was placed under French control as part of the Syrian mandate. After Ataturk founded the modern-day Turkish Republic in 1923, “liberating” Hatay became a matter of national and personal pride. When bilateral negotiations in Paris over the province’s fate stalled in 1936, Ataturk set out by train toward the Syrian border, threatening to “resign and lead the army into the Sanjak himself if its fate could not be resolved in a manner consistent with Turkey’s honor.” His government also provided covert support to Turkish nationalist guerrillas planning an insurgency against the French. Then in 1937, as detailed in Sarah Shield’s excellent Fezzes into the River, Ataturk “took to the road once again to demonstrate the urgency of Turkey’s claim.” In cities and military bases along the border, the president reviewed his soldiers, hoping to leave the French with no doubt over his willingness to settle the issue by force. The fight against France’s mandate of Syria ended on the eve of World War II, when France, its strategic position in Europe increasingly desperate, acceded to Turkey’s demands and returned Hatay to Turkish control. Patient diplomacy and a well-timed show of force had secured for Turkey a valuable new province, whose people’s loyalty the government then belatedly won over the course of the next several decades. Indeed, the only price Ankara paid for its acquisition was a half-century of Syrian hostility. The Syrians continued to lay claim to Hatay, leading to problems throughout the Cold War. Turkish nationalists didn’t help matters in the 1950s when they responded to Syrian irredentism by suggesting they might not mind acquiring the neighboring Syrian province of Aleppo, too. 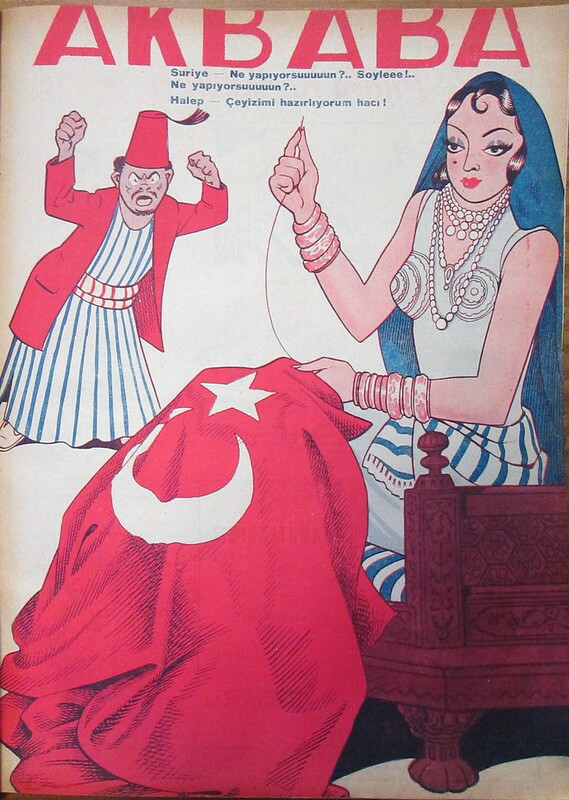 (A cartoon from the period shows Aleppo preparing a flag as a dowry for Turkey, while a crude caricature of Syria looks on with anger.) Turkish-Syrian tensions during this period helped push Damascus toward the Soviet Union, thereby setting the stage for another threat of Turkish invasion. When Damascus seemed to be drifting too far into the Soviet orbit in 1957, Turkey’s government suggested that a military operation might secure a friendlier Syrian regime. U.S. diplomats nixed the plan, explaining that while they admired Turkey’s anti-communist zeal, there was no need to alienate the Arab world with an outright invasion when they could just continue discreetly plotting coups instead. Had Turkey capitalized on its success by pursuing a peaceful resolution to the Kurdish question, Ocalan’s capture could have been transformative. Instead, the opportunity for a negotiated settlement was squandered. In jail, Ocalan proved newly willing to cooperate, and even many in the Turkish military came to realize that the PKK could never be destroyed by force alone. Over the last decade, the ruling Justice and Development Party, AKP for its Turkish name, undertook unprecedented efforts to make peace with the PKK but was never quite committed or courageous enough to succeed. Bold gestures, like delivering increased Kurdish cultural rights, alternated with (U.S.-approved) air and ground assaults against PKK bases in Iraq like those of the past week. In the 1930s, Turkey won Hatay and lost Syria. In 1998, it managed to mitigate a civil war that now risks erupting with renewed fury. If Ankara hopes that today a combination of threats and limited intervention can solve its most pressing problems in Syria, it may well be right. But if military force proves effective in forestalling Kurdish or jihadi gains, it has historically proved incapable of achieving what has long eluded Turkey: a stable and secure southern border.